Orders are processed on a first-in-first-out basis. Items that are in stock will be shipped within 3-5 business days of order confirmation. Custom design and orders which require setting of a diamond require additional time, which is typically 7 business days from date of order. Express order filling may be available on certain items. 1) The Chicago Diamond and Jewelry Exchange uses Federal Express as our preferred carrier. 2) All 2nd Day and Overnight Priority shipments require a signature on delivery. 3) When using our free "FedEx Express Saver" shipping option please be aware that FedEx does not have a "signature required" option and the customer is solely responsible for FedEx Express Saver deliveries. 4) Our preferred carrier is FedEx and the standard shipping charges below are for FedEx only. Any other carriers, if requested to be used, may require extra charges to be determined. Delivery is limited to the United States except for military APO and FPO addresses that will be sent via USPS Priority Mail Service only. FedEx deliveries cannot be made to P.O. Boxes. Merchandise will be shipped to the billing address on file with the applicable credit card company. If the shipment is to be made to any other address, the customer may need to advise his credit card company of the alternate address. For orders under $1000: FedEx Saver service is free, 2nd day FedEx service is $10, and FedEx priority is $15. For orders of $1,000 - $2,500: 2nd Day FedEx is FREE and FedEx priority is $15. For orders over $2,500: FedEx priority service is FREE. The customer will be notified of any delays in shipment via e-mail. In the unlikely case that an is out of stock, The Chicago Diamond and Jewelry Exchange. will contact the customer with the estimated date of delivery, and charges will be made to credit cards only if the customer agrees to the delay. The images featured on this web site may have been altered, reduced or enlarged. These images are intended to represent the general design and appearance of items on this site. They are not intended as an actual picture of the piece that will be shipped. The Chicago Diamond and Jewelry Exchange and it's partners are proud to offer only the finest quality diamonds available. While aspects of diamond grading are subjective, a diamond Grading Report from the Gemological Institute of America (GIA), European Gemological Lab (EGL) or the American Gem Society (AGS) will accompany our loose diamond inventory. Diamonds graded by other grading laboratories may also be available with your purchase as well. These laboratories are recognized around the world as the finest in gem grading. In supplying Lab Certificates, and/or Grading Reports from respective laboratories for its merchandise, The Chicago Diamond and Jewelry Exchange. accepts and supports such documents exclusively, as proof of identity and quality of corresponding merchandise. You can always be confident that the item being purchased matches what is described in the corresponding certification and grading documents. In the event that the customer wishes to have merchandise examined by another laboratory or grading entity, The Chicago Diamond and Jewelry Exchange. can accept no responsibility for those results. Such findings will in no way affect or alter certification, appraisal or grading documents provided by The Chicago Diamond and Jewelry Exchange , and shall simply serve as the customer's reference items. The Chicago Diamond and Jewelry Exchange presents our evaluations/appraisals in accordance with the scientific methods applied during the examination. 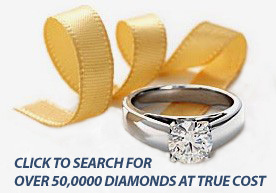 This service is provided for a fee by The Chicago Diamond and Jewelry Exchange. Its appointees and agents are not responsible for possible dissimilarities and/or differences that could appear from repeated examinations or as a result of other methods applied. The Chicago Diamond and Jewelry Exchange presents these appraisals/evaluations to the client solely for his own use and shall not be held responsible for any claim whatsoever, which may be made on the basis of this evaluation. It is the aim of The Chicago Diamond and Jewelry Exchange to be the premier choice for fine quality diamonds and jewelry. The Chicago Diamond and Jewelry Exchange has a limited 30-day warranty, and is guaranteed against defects in manufacturing and workmanship. This warranty does not, however, apply to items subjected to excessive wear, abuse, or physical damage whether accidental or otherwise. Upon acceptance of delivery, insurance and protection of merchandise becomes the sole responsibility of the customer, and The Chicago Diamond and Jewelry Exchange shall not be held liable for any loss, theft, or resulting damages that may subsequently occur. Protection of offline customer information is of paramount importance to us. All customer information, not just the sensitive information mentioned above, is restricted in our offices. Employees are granted access to personally identifiable information on a strict "need to know" basis. The servers which store personally identifiable information are located in a secure environment, in a locked facility. If users have any questions about the security at our website, they may send an e-mail to: support@chicagodiamondexchange.com. The images featured on this website are intended only to represent the general design and appearance of the item. They are not necessarily actual, full size pictures of our merchandise, as photos may be enlarged or reduced according to the format of the page. Both session ID cookies and persistent cookies are used in this process. With session ID cookies, once the customer closes the browser, the cookie simply terminates. A persistent cookie is a small text file that remains stored on the customer's hard drive. Persistent cookies can be removed by following your Internet browser instructions. Upon receipt of shipment information, you may track your order at www.fedex.com.
. Prior to returning any merchandise, please contact our Customer Service Department by calling 1-866-533-0970, or send us an online Inquiry to obtain a Return Merchandise Authorization (RMA) Number. This number must be referenced on paperwork accompanying your return, and must be clearly marked on the outside of the shipping package.
. Merchandise may be returned or exchanged within 30 days of delivery in original condition, in the original packaging with the security tag intact. All returns must be accompanied by the proof of purchase and original shipping papers. The RMA number must appear where indicated on the shipping document and written on the outside of the package; please indicate reference for refund or exchange where indicated.
. All Returns must only be shipped to the address indicated in the RMA instructions. If the return merchandise is returned to any other address other than that indicated, the customer will be charged a $ 50 handling fee.
. All returned merchandise will be inspected by The Chicago Diamond and Jewelry Exchange prior to issuance of refunds or exchanges.
. The full cost of the return item will be credited(merchandise credit), EXCLUDING shipping, handling and insurance costs.
. Diamond returns must be accompanied by the original matching or identifying grading report(s), along with the original warranty document. Should the diamond grading reports(s) or warranty document not be included with the merchandise, the customer will be charged a $150 replacement fee for each missing document.
. Custom work, special orders (including rings that have been charged an extra charge for sizing), personalized or engraved items cannot be returned unless there is an error on the part of The Chicago Diamond and Jewelry Exchange. Shipping and handling costs will be refunded only when the return is necessary due to our error, or when we have confirmed the merchandise is defective.
. If the item is defective or not as ordered, the customer has the option of requesting a refund or an exchange for the purchase. 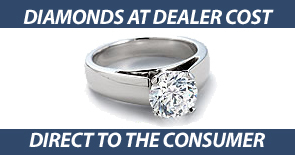 The Chicago Diamond and Jewelry Exchange will provide service and repair to any jewelry that it sells. Please contact our Customer Service Department if you have any questions concerning repairs or alterations. We will not be responsible for any repairs or alterations made by any outside party without the prior consent of The Chicago Diamond and Jewelry Exchange. Any alteration made without consent voids any warranties, including the 30 day refund policy. No refunds will be made for any repair work undertaken by a third party.
. Returned merchandise must be shipped prepaid (via Federal Express, UPS or U.S. Mail - Registered Delivery), and insured for the full purchase price. While we offer only the finest quality merchandise, service or repair might occasionally be necessary. For sizing, alterations or repairs, please contact our Customer Service Department. The Chicago Diamond and Jewelry Exchange reserves the right to correct, update, modify or otherwise change the terms and conditions of sale, information, and prices at any time at our sole discretion and without notice. The Chicago Diamond and Jewelry Exchange, it agents, affiliates or employees shall not be held liable for any indirect, incidental, punitive or consequential damages arising directly or indirectly from the use of any of the information contain in or received from this site. Appraisals, Grading Reports and Lab Certificates are in part, subjective, and may vary as to qualities and descriptions depending upon the agent, laboratory, appraiser and the scientific methods applied. The user hereby acknowledges that the use of this site and its recourses, information and services shall be solely at his/her own risk. The Chicago Diamond and Jewelry Exchange, its products, images, logos and all other items contained in this site are protected by U.S. and international copyright and trademark laws. It is expressly prohibited to reproduce, use, modify or in any way display or distribute this information without permission. User further agrees that these conditions cannot be modified by any oral statements or any other dealings between The Chicago Diamond and Jewelry Exchange and the user.